Dylan Lear is an avid photographer and traveler. He has traveled across most of the United States and to several countries in Europe. Born, raised, and currently living in Louisville, Kentucky, most of his work comes from that area. Walking the streets of the city, he has captured countless images that show what the city is truly like. Dylan's favorite category to shoot would be urban decay. Capturing the industrialization of man crumbling over time and taken back by nature. Closely following that category would be artistic and creative shots. The lines and shapes that colors and light has to offer, ranging from sparks while welding to light trails on a highway ( as seen in the cover image). Lastly he enjoys nature. The pure beauty of what is all around combined with the colors, you can't go wrong. 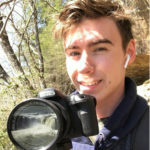 Dylan is currently setting up photography workshops to be available for small groups of people. Workshops will include weekend expeditions to some state parks and national forests, exploring the great city of Louisville, and week long excursions to the beautiful city Prague in the Czech Republic. Stay posted for when those will be available. Dylan also offers wedding photography packages within the Louisville area. Destination weddings are also available, but please contact him directly to see pricing and options with that. He also offers real estate photography services. Most photos on this site are for sale as prints as well. Use the purchasing option on this site to order prints. Dylan exclusively shoots on Canon currently using a 7D Mark II body.